Seafood risotto, baguette, and wine...wow. It's the perfect meal. Yum - definitely trying this one! This looks and sounds wonderful! 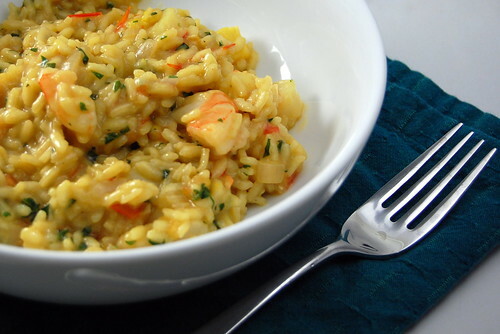 I am planning on making a shrimp risotto for this weekend. Now I can't wait! I love risotto and can't wait to make more now that the weather is getting cooler. This looks like a great recipe, and I love the one-pot convenience. I recently discovered risotto, and it was everything I dreamed it could be. This looks wonderful! Molly, don't be intimidated! Its nothing to be scared of... you just stand at the stove and stir, stir, stir (with a glass of wine in your hand)!